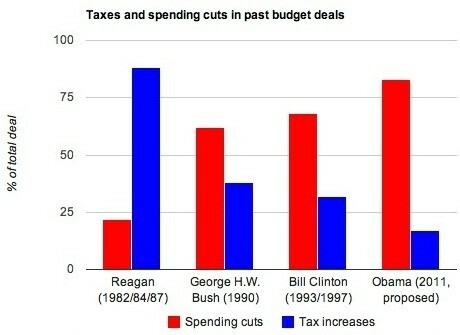 Ezra Klein asked the Center on Budget and Policy Priorities to help him with the numbers for this graph. As you can see, Obama is engaged in obvious class warfare… the President should be more like Reagan. These graphs are misleading at best. It has no information on Tax Cuts nor Spending Increases. Without this information, these numbers are completely meaningless. Hey Joe, thanks for commenting. You’ll have to be more specific as to why you think it’s “misleading.” I was using the graph to bust the myth that Obama budget deal somehow out of the mainstream and an example of “class warfare.” A charge I’ve heard numerous GOP presidential candidates and commentators make. “GTSCW” stands for Graphs that Subvert Conventional Wisdom. It’s a semi-regular feature on this site. I’ll update that on the post. Increasing revenues through taxes is a normal way to counteract a large debt. Republican presidents like Reagan and Bush 1 accepted this reality – I hope today’s Republicans can recognize that a deal that mostly cuts spending and closes market distorting tax loopholes is a reasonable compromise. Some numbers are provided by Ezra Klein (where I got the graph). Is there specific information you had in mind that would provide more meaning for you? What I meant is, without knowing when or by how much spending has increased, it makes the spending cuts figure meaningless. Imagine a president (or legislature, really) who in one year doubles spending, then subsequently goes about slashing the budget. If spending is already inflated, it is easy to cut it and look like a hero. So there could be a continuous waxing and waning of spending and whoever comes in when it is most inflated can look like the hero. In Obama’s case, he came in after a wild, gov’t expanding spending spree by the Bush administration. He could cut all day long and spending still won’t be down to pre-Bush era spending. As far as taxes go, it is the same thing. Taxes definitely have their place, but without more figures it is difficult to know what the increases mean. I don’t care as much how much of a deal relies on tax increases as much as I care if taxes are going from 10% to 15% or from 20% to 23%. The point is, if spending is already slim and taxes are low when you walk in, it’s going to be hard to make the graph look good for you. But if spending and taxes are high, you are going to look like a hero. I am not refuting the apparent message, I am just saying that this graph isn’t conclusive or even necessarily informative. Fair enough. I simply intended to show that Obama’s deal, contrary to a lot of conservative critiques, isn’t an unreasonable and leftist arrangement. You’re right though that a baseline and context is needed to better understand the situation from a policy standpoint. I have accepted that it’s all political posturing. Whenever you try to interject actual economics into these things the result is almost always infuriating.